Although the DS (and ID) were manufactured during almost 20 years, they seem not to have changed very much during that time. 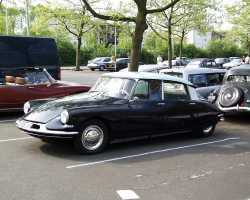 There was only one really obvious and big change; starting from september 1967 (model year 1968) the DS and ID got a new front (fig. 3 below). But if one looks a bit closer to all those DS/ID's, on a big Citroën meeting for example, more (smaller) changes become obvious: In sept. 1959 the rear wings became a bit longer, in sept. 1962 the front changed (bumper, air-intakes), in sept. 1971 the door handles changed. If one looks at the interiors, different types of dashboards and a change of the shape and cloth of the seats in sept 1968 are observed. 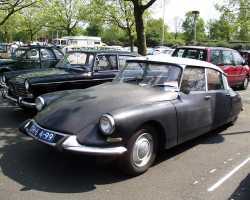 A few other important changes are not easily seen : In sept. 1965 the DS got a completely new engine and gearbox, the ID followed on year later. Also changed in 1965 were the drive shafts, the front brakes and the way the wheels are mounted onto the hubs (5 bolts instead of just one central bolt). 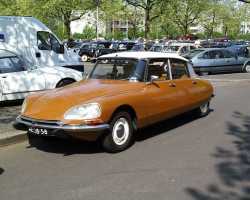 Much more smaller changes can be found on closer inspection and if one takes the time to study the different parts books that Citroën published over the years, one gets the impression that hardly any part of a 1955 DS19 is really indentical to the same part on a 1975 DS20.